Part of SEVA’s mission is to educate people about the benefits of driving electric. 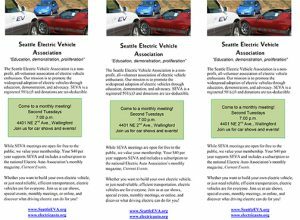 As such, we have created a pamphlet to hand out that talks a little about why driving electric is the wave of the future, the cost benefits and that also invites people to attend our monthly meetings. Below is the flyer in a printable, high-resolution 300dpi format. Please note that there are three flyers per page. If printing at home, please also note that this is a DOUBLE-SIDED document.